On Saturday, October 10th, the South Lake Business Association will present the 7th Annual “Taste of South Lake”, Pasadena’s largest culinary celebration! Guests can enjoy mouth-watering offerings from over 25 South Lake Avenue restaurants, live cooking demos with celebrity chefs, music performances by internationally known bands, a vendor village and more! This free outdoor festival will be held at the Corporate Center Pasadena located at 251 S. Lake Avenue in Pasadena. For more information, please visit Taste of South Lake 2015. DOWNLOAD EVENT FLYER – Coming Soon! DOWNLOAD EVENT MAP AND PROGRAM- Coming Soon! DOWNLOAD EVENT FLYER! Coming soon! Cross Campus DTLA is centrally located across the street from the 7th & Grand Metro station and just a block off of restaurant row. The 33,000 square-foot campus with its twenty-foot, floor-to-ceiling wraparound windows and “California modern” design brings a bright, productive environment to Downtown. Powered by all of the same business resources as our other locations, and some new amenities we’re excited to introduce, Cross Campus is the home of creative professionals who want to work and play in DTLA. Is Pasadena a perfect city for Vertical Gardening? ColoradoBlvd.net has a story about the possibility of making the newly renovated AT&T building a site with vertical gardens. With Fleming’s Steakhouse announcing their opening a location at the AT&T building and new tenants moving in, does a vertical garden here make sense? While there are vertical gardens in many locations, and there are personal variations of vertical gardens, one on the mass scale to feed dozens if not hundreds of people are not yet proven. Headlines like these will help to stimulate the discussion further, much like solar, and other new technologies. But are micro farms the real answer? We are facing some real challenges when it comes to our food sourcing, production, packaging and transportation, the offset of commercial large scale farming operations make it difficult for small scale farmers to compete. It comes down to cost and values to consumers as to what consumers will pay for products. If like solar and EV the government provided incentives then perhaps large scan vertical farming would take off even faster. Otherwise if left to capitalism the cost will have to be reduced to compete with traditional methods and that would is less likely. There are some large scale vertical farming operations making headway, but what they grow is limited. AeroFarms in New Jersey for example has one of the largest commercial farming operations. While there are little details we do know that Market on Holly has been closed for approximately 2 months. The windows are covered and no further details are available. Interesting is that the website is still running. We understand that the business changed hands recently and that changes had been made to attempt to improve business, but apparently it was not enough. We hope to see a new business open here. We took a Nissan Leaf hundreds of miles through some of the most beautiful parts of the UK, and discovered plenty of the challenges facing EV drivers along the way. Here’s another story of a LEAF driver’s trip going bad. Not to mention that Nissan has done a disservice to owners by playing games with the battery issues. Nissan is trying to recoup their investment in EV on the backs of unsuspecting owners and buyers. Lease if possible and don’t buy a Nissan LEAF if you can avoid it. As an early adopter 2011 LEAF with 9 bars of capacity, Nissan refuses to replace batteries although the batteries are at less than 60% of their original capacity measured by “range”. Test Drive one of our latest Galaxy smartphones on your current carrier for 30 days with no obligation for just $1. After that, simply return it. Or, if the phone feels right for you, go ahead and upgrade. You have to signup from your iPhone in order to take advantage of the promotion. We don’t know what the phones cost if you decide to keep it. Thank you for your interest in the Samsung Ultimate Test Drive! Our program gives iPhone users the opportunity to learn more about our latest Galaxy phones. Due to the design of the program, we request that you enroll from your iPhone device to receive your Test Drive phone. For other great offers please visit www.SamsungPromotions.com. If you bought a Nissan LEAF in 2011 to 2015 you are noticing the battery capacity is reduced year by year. There are rumors that Nissan is releasing a 110 mile range version of the LEAF, that as battery capacity drops will probably be in the 50-60 mile range. This is being realistic as Nissan has been sued twice at least for misrepresentation claims and has lost. If you bought a 2011 Nissan LEAF you are certainly not getting the range you once got, that’s a guarantee, not Nissan is attempting to not cannibalize 2015-2016 sales by keep the new model of the Nissan under wrap as long as possible and perspective buys will either avoid the LEAF or wait for the new model. It is interesting to note that Nissan LEAF sales having been declining as BMW, Tesla, Volt have been increasing. In many markets the BMW and Tesla surpass the sales of Nissan LEAF. Next month there is an Elective Drive Week, where you can see the vehicles that consumers are buying. Having purchased a LEAF and been burned by the questionable advertising tactics of Nissan, and having trying to reason with representatives of Nissan and hitting a brick wall, does not speak highly for anyone else interested in purchasing a Nissan LEAF or any other Nissan product. The recommendation if you insist on buying a Nissan LEAF is to wait, and lease not purchase as no matter how you look at it, the LEAF batteries will have to be replaced. Fleming’s Steakhouse has long been rumored to be looking for a space in Pasadena, most recently it was suspected to be opening in the South Lake Ave Business District, and now it looks to be in the Old Pasadena. Here’s the Notice of Public Hearing posted for conditional use permit #6337. The applicant for the property, EBI Consulting for Bloomin’ Brands. The location is 6,800 sq ft.
More to follow, but we imagine the location will be on the ground floor, but it could be on the Penthouse. Would put it inside the AT&T building, which has been transformed into a new “technology” center, with rumors of new tenants moving in. The view form the penthouse is amazing. If you are interested in learning more, attend the public hearing on Wednesday, August 19, 2015 at 6pm. Hale Building Permit Center Hearing Room. 175 N. Garfield Ave. There are a several Fleming’s in the Los Angeles area. Pasadena is a perfect choice for expansion. After many years, 6 to 8 years in the making the Pasadena General Plan after hours of questions being answered by City of Pasadena Planning Dept. There are still issues which remain, but the general consensus was that the city needed a plan. There are fears that by imposing new restrictions and the already in progress developments that Pasadena will hit the limits of the plan and that a moratorium will be put in place to stop further development. It is hard to predict the future but if the past is any indication there could be some issues in the coming years with growth being crippled because of the General Plan. There are other concerns which revolve around water and electricity, but mobility is one area the plan addressed with public comment using New York and Santa Monica as areas with periods of uncontrolled growth that are suffering because of the population density. Could Pasadena become gridlocked, due to large developments? There are already some large developments in the Old Pasadena, Playhouse District, Central Downtown, and more coming, at least 10 large projects are underway at some phase. The largest of the projects being developed is the Parson’s project with the first phase at approx 650k sq ft. and 600+ living units in the first phase, this will surely have an impact on traffic and accessibility around the area. It could become an area that local residents will avoid because of the traffic jams. In the coming days, months, and years, there will be those critical of the General Plan, perhaps it may not serve their interest, but it does serve someone else. Having a win-win with this is difficult at best. Some people don’t want any growth, some want lots of growth. Where you stand is your right, expressing your position is also your right, and we elect city officials to help steer our city in the right direction. The verdict is out wether those elected will achieve this goal. In particular considering the embarrassment of the long term embezzlement. Will take place October 19-25. Featuring independently organized seminars, workshops and social events hosted in the Pasadena area and focus on design, technology, science, and business events. Discover more about design trends, open data efforts, crowdfunding, emerging biotech, 3D printing, successful entrepreneurship, and innovation in Pasadena. I downloaded the Veggie Grill’s Love app and I think you should too! Just follow the steps below to earn some Love and an extra 50 points after you snap a pic of your first receipt. 1. Download the app in the Apple App store or Google Play store by searching for “Veggie Grill”. 2. Copy this code (case-sensitive) and enter it in the “referral code” field when you Sign Up. Happy snapping and Live It Up! every time you dine with us, snap a picture of your receipt with our app and for every dollar you spend you’ll receive a little love in return. loyalty rewards. free food. online ordering. nutrition calculator. don’t have a smartphone? sign up for our e-mail program here. FREE pizza slice to you and your bestie! 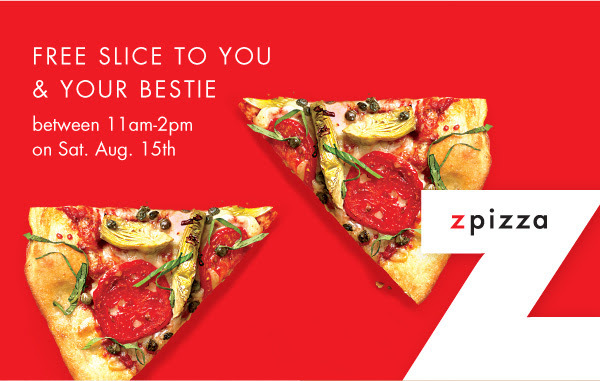 Celebrate National Best Friend Day Saturday August 15th between 11am-2pm and enjoy a hot pizza slice, FREE for you & your bestie! Join us for a spectacular outdoor beer drinking event…on the Meadow! ATCC Beer Club presents “Epic Brewing” on Saturday, August 15th at 6:30 p.m. Please RSVP online at altaclub.com or with the Front Desk. Everything you need to create and sell your eBook and printed book. Save $150 on custom book printing of 150 books or more at BookBaby. Use coupon code BEACH150 at checkout. Location in Highland Park with Altadena being second location to open. Paul Martin’s Pasadena Location Opening November 2015, a little over a year after the legal notice was posted. The signs and construction of the South Lake Pasadena location of Paul Martin’s is on the fast track and banners indicate that the location is slated to open November 2015. Look for Paul Martin’s to shake up area and bring a much needed refresh to the area which has suffered from various closures and vacant buildings. The South Lake Ave location will pull in from South Pas, San Marino, Pasadena, Altadena, La Canada, Glendale and other cities in the SGV and SFV. We are looking forward to Paul Martin’s America Grill opening late this year.